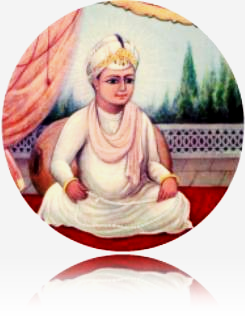 The eighth Guru, Shri Guru Har Krishan Ji, was born in 1656. The "Divine Light" was bestowed upon him in 1661. To the Sikhs he proved to be the symbols of service, purity and truth. The Guru gave his life while serving and healing the epidemic-stricken people in Delhi. Anyone who invokes Him with a pure heart has no difficulties whatsoever in their life.